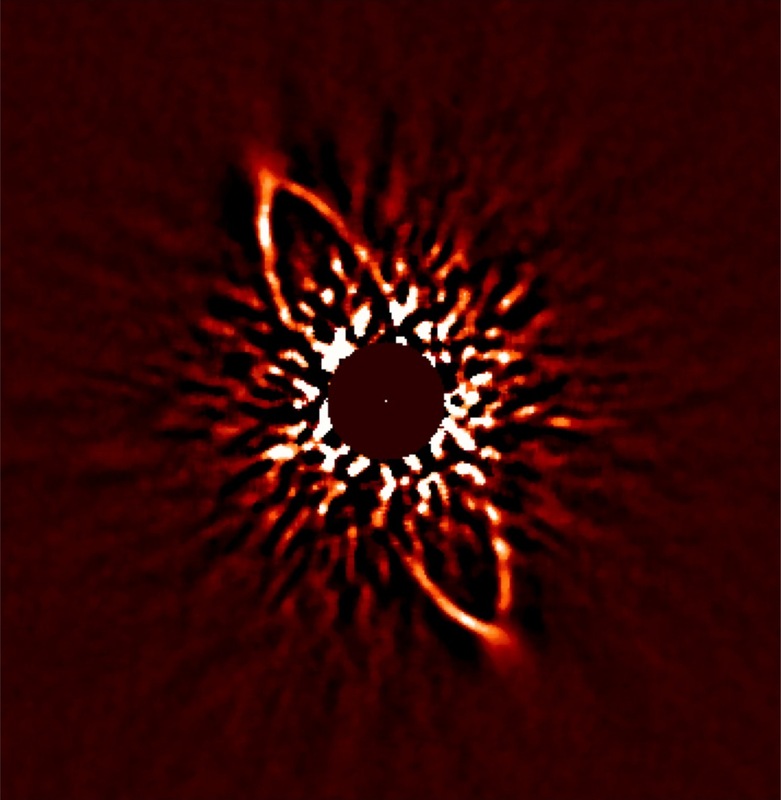 The SEEDS (Strategic Exploration of Exoplanets and Disks with Subaru Telescope/HiCIAO) project, a five-year international collaboration launched in 2009 and led by Motohide Tamura of NAOJ (National Astronomical Observatory of Japan) has yielded another impressive image that contributes to our understanding of the link between disks and planet formation. Researchers used Subaru's planet-finder camera, HiCIAO (High Contrast Instrument for the Subaru Next Generation Adaptive Optics), to take a crisp high-contrast image of the dust ring around HR 4796 A, a young (8-10 million years old) nearby star, only 240 light years away from Earth. The ring consists of dust grains in a wide orbit, roughly twice the size of Pluto's orbit, around the central star. The resolution of the image of the inner edge of the ring is so precise that an offset between its center and the star's position can be measured. Although data from the Hubble Space Telescope led another research group to suspect such an offset, the Subaru data not only confirm its presence but also reveal it to be larger than previously assumed. 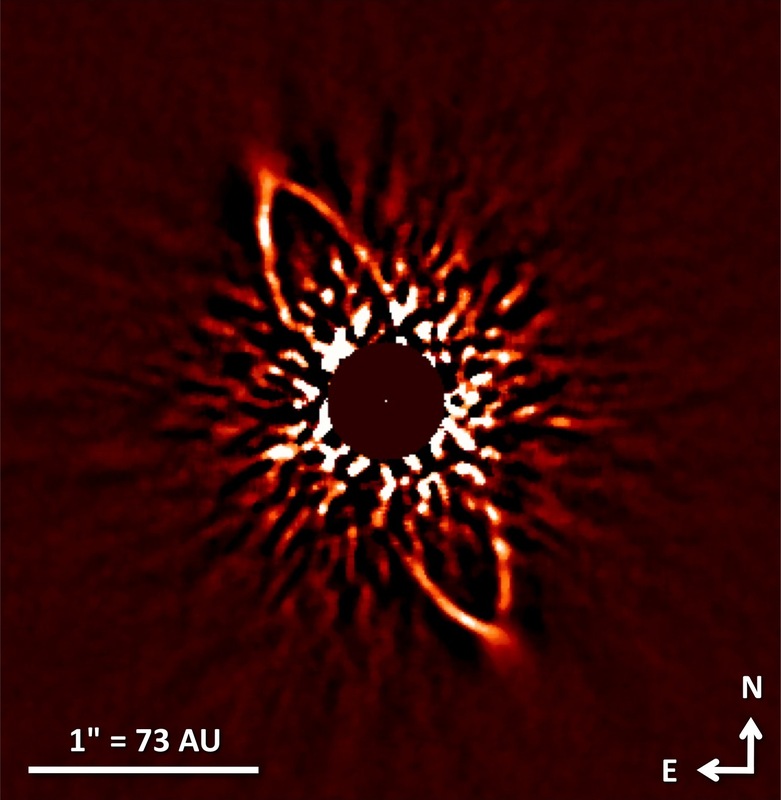 Figure 1: Near-infrared (1.6 micron) image of the debris ring around the star HR 4796 A. An astronomical unit (AU) is a unit of length that corresponds to the average distance between the Earth and Sun, almost 92 million miles (over 149 million km). The ring consists of dust grains in a wide orbit (roughly twice the size of Pluto's orbit) around the central star. Its edge is so precisely revealed that the researchers could confirm a previously suspected offset between the ring's center and the star's location. This "wobble" in the dust's orbit is most likely caused by the unbalancing action of – so far undetected – massive planets likely to be orbiting within the ring. Furthermore, the image of the ring appears to be smudged out at its tips and reveals the presence of finer dust extending out beyond the main body of the ring. For high resolution versions of the above image, click on the following links: Image only or Image with labels. What caused the wheel of dust around HR 4796 A to run off its axis? The most plausible explanation is that the gravitational force of one or more planets orbiting in the gap within the ring must be tugging at the dust, thus unbalancing their course around the star in predictable ways. Computer simulations have already shown that such gravitational tides can shape a dust ring into eccentricity, and findings from another the eccentric dust ring around the star Formalhaut may be observational evidence for the process. Since no planet candidates have been spotted near HR 4796 A yet, the planets causing the dust ring to wobble are probably simply too faint to detect with current instruments. Nevertheless, the Subaru image allows scientists to infer their presence from their influence on the circumstellar dust. The Subaru Telescope's near-infrared image is as sharp as the Hubble Space Telescope's visible-light image, thus enabling accurate measurements of its eccentricity. While Subaru Telescope's mirror is much larger than Hubble's, light from the HR 4796 A system must first pass through the turbulent air layers of Earth's atmosphere before Subaru's instruments can measure it. Subaru's adaptive optics system (AO188) allows it to correct for most of the atmosphere's blurring effects in order to take razor-sharp images. The application of an advanced image processing technique, angular differential imaging, to the data suppressed the star's bright glare and enhanced the faint light reflected from the ring so that it was more visible. This image gives scientists more information about the relationship between a circumstellar disk and planet formation. Planets are believed to form in the disks of gas and dust that remain around young stars as the by-products of star formation. As the material is swept up by the newborn planets or blown out of the system by the star's radiation, such (primordial) disks soon disappear in a few tens of million years. Nevertheless, some stars are surrounded by a debris or secondary disk, mainly composed of dust long after the primordial disk should have dispersed. Collisions between small solid bodies ("planetesimals") left over from planet formation may continuously replenish the dust in these disks. 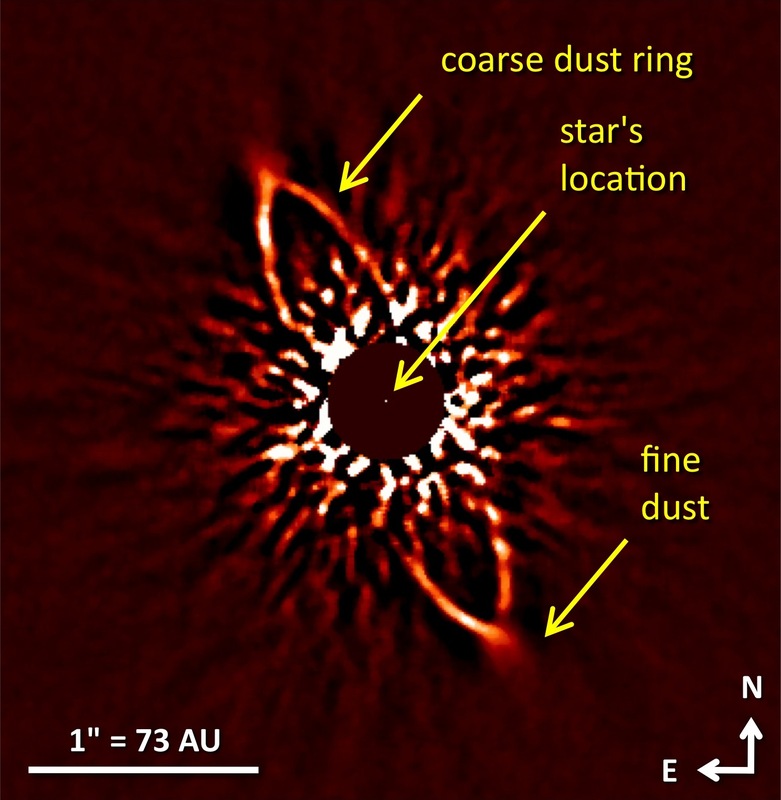 The dust ring around HR 4796 A is such a debris disk and provides essential information for studying planet formation and possible formed planets in such debris disk systems. 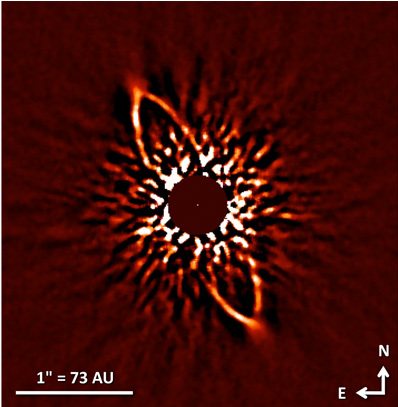 Direct Images of Disks Unravel Mystery of Planet Formation, February 17, 2011. Discovery of an Exoplanet Candidate Orbiting a Sun-Like Star, December 3, 2009.